These easy summer dessert tacos are the ultimate summertime treat! Top them with fresh fruit, chocolate or caramel sauce, and whipped cream for a laid back dessert! Preheat a small-medium sized pan or nonstick skillet over medium heat and spray with cooking spray. Mix together all crepe ingredients with a hand mixer until very smooth. Pour 1/4 cup batter onto the pan and immediately tilt the pan in a circular motion to spread the batter into a larger circle. Cook about 45-55 seconds, then flip and cook another 45-55 seconds. Transfer to a plate and put it in the fridge to chill. Repeat with remaining batter. 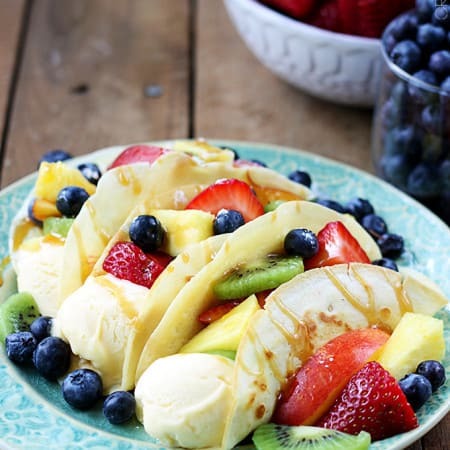 Fill crepes with vanilla ice cream, then top with whipped cream, sliced fruit, and caramel or chocolate sauce. Serve immediately. Enjoy!